Download "Level With Me" v1.0 full, over here. If you're an OSX user, it's technically possible (but incredibly inconvenient) to play Portal 2 mods, so let it be known that you were warned. If you have any tech support problems, leave a comment on our ModDB comment-o-matic and I'll try to help you. Thanks for your time and I hope you find the mod's okay by you. Big thanks to Jim Rossignol, Alec Meer, Dan Pinchbeck, Jack Monahan, Magnar Jenssen, Brendon Chung, Davey Wreden, Ed Key, and Richard Perrin for making this all possible. Do you have Portal 2 installed on steam? But that is a terrible reason to hate the game, becuase you haven't actually played it. It just crashed your game for some reason. And I'm pretty sure that isn't the game. 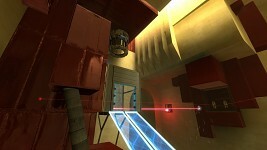 An open discussion question to all: must every Portal 2 map have difficult puzzles in them? The last chamber of Chapter 1 is intended to show that, yes, it's fully within my capability to design something difficult, and I (and the other designers) purposely chose not to do so. Is that a valid way to design? And if it isn't, why not? I think there should be a balance between hard and fun. You've gotta make a chamber a bit complicated, but not so hard to figure out that it isn't fun anymore. I'm not sure if people fully appreciate this map pack. 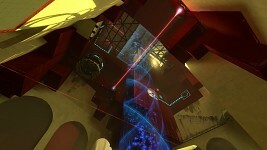 It is not just art puzzles in portal 2. It is a very abstract telling of messages through games. And that is a very important theme that I feel gets wrapped up nicely at the end. It played great for just maps to play, but this is more. It is almost like a paper written to point out that the more levels you play tells more of a story. I would love for this to have an interview (podcast) with someone because I feel a need to discuss or hear a discussion about the different meanings. Just the meaning portrayed by the chairs is fantastic. Sorry for the wall of text, but I love abstract work, and this really is a paper of example, discussion, and conclusion. That last puzzle in Ch 1 was pretty difficult, especially after the first few easy ones. Very cool.